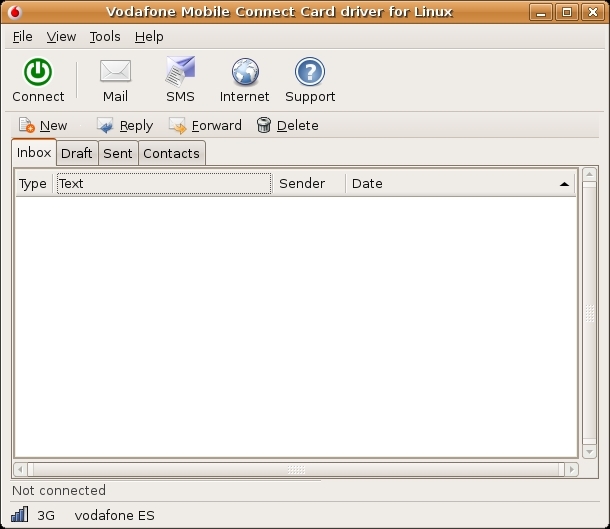 Vodafone Mobile Connect Card driver for Linux is a tool that allows you to establish a connection to the Internet using 3G cards. It also allows to send and receive short messages from your computer. The cards currently supported are: Huawei E620, Huawei E220 and Option GlobeTrotter 3G+ EMEA . Vodafone Mobile Connect Card Driver for Linux has been tested on Linux 2.6.17 and newer. If you have an older version installed, we would recommend to update it before going on. Your distribution of choice will most likely provide recent versions of the Linux kernel, downloadable from the Internet. If Vodafone Mobile Connect Card driver for Linux is not included in your distribution, you can still install it using your package system (.deb on Debian/Ubuntu-based systems, .rpm in Fedora, Mandriva, SUSE, etc). Before doing so, make sure you have the needed dependencies installed (python-serial, python-central, python-notify, python-twisted, etc). If you use some other kind of distribution, you will probably need to install the program from its source code (see the documentation). replacing "fred" by your username. On other systems, such as Fedora, you will need to have gksu o kdesu installed in order to be able to connect to the Internet. Those programs will ask for the superuser's password before stablishing the connection. Plug your 3G device to the computer, following the directions found in its userguide. Depending on the model you own, you will have to insert it in a PCMCIA slot, or attach it to the USB ports. Some Linux versions have trouble recognizing some card models. You are now ready to start using your 3G device on GNU/Linux. First time you run the program, you will have to do the initial setup. The program will automatically recognize the card model, but you will have to specify your preferred kind of connection. GPRS (General Packet Radio System) is not a high speed connection, but as it is based on the already existing technologies, its coverage is nearly absolute. On the other hand, 3G is a broadband connection, but as it is a recent technology, there are areas where it has not been deployed yet. Generally, it might be wise choosing the 3G preferred option. This way, the system will try to connect using 3G technology. If that is not possible, it will fallback to GPRS. Over the splashscreen a popup window will ask you to enter your PIN (Personal Identification Number) which was provided together with your SIM card (Subscriber Identity Module). Be careful when typing your PIN; if it is introduced wrongly for three times, the card will be blocked, and you will need your PUK (PIN Unblocking Key) to unblock the card. The application will then read the messages and contacts stored in your SIM, and will show its main screen. In order to connect to the Internet, press the green-colored Connect icon in the iconbar (just under the menubar). A small window will popup, telling you that the connection is being stablished. If the connection is succesful, that window will promptly disappear, and the status bar (at the bottom of the screen) will show the connection mode, the network you are connected to (vodafone ES) and the download/upload traffic. Depending on the country you are, and the ISP used, you might need to modify the connection data using the menu entry Tools -> Preferences. You can also have multiple wvdial profiles, customizable from the application itself. In order to use Internet services (web browsing, e-mail, chat, instant messaging, etc), just launch the appropiate programas and use them as usual. For your convenience, Vodafone Mobile Connect Card Driver for Linux provides Mail and Internet icons, which will open your default e-mail client and web browser. Once you have finished using the Internet, press the red-colored Disconnect button, at the very same place where the connection button was. 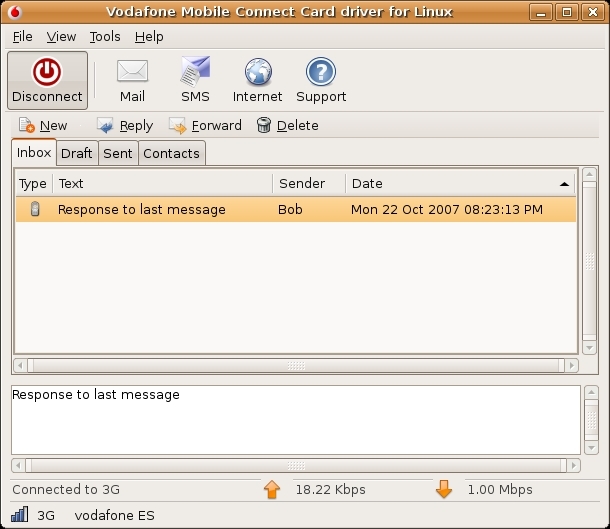 Vodafone Mobile Connect Card Driver for Linux allows you to send and receive short messages (SMS) from your computer. Under the menu and iconbars, you will find the SMS and addressbook bar, including the buttons New, Reply, Forward and Delete. 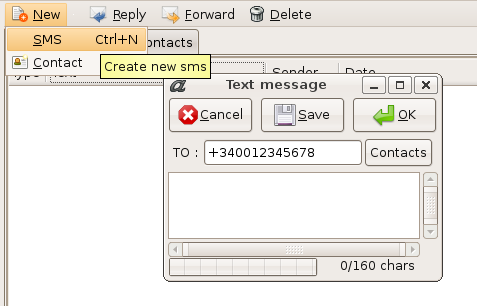 In order to write a short message, choose New -> SMS, or press the key combination Ctrl-N. A new window will popup, where you will be able to type in the telephone number you want to send the short message to, as well as the text itself. The phone number must be introducing using the international format, such as +45670123456, where 45 is the country code. You can select as well any number stored in your addressbook. The statusbar shows the amount of characters written so far. Short messages have a limit of 160 latin characters, or 70 UCS2 characters (codification used to write in some languages as Chinese). In order to send your message, press the Accept button. If you want to delay sending or composing the message, you can store it in Drafts by pressing the Save button. 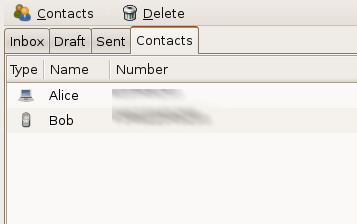 Under the buttons bar, there is other bar with some tabs labeled Inbox, Drafts, Outbox and Contacts. Received messages are stored in the Inbox. They can be sorted by reception date, sender or subject. When selecting a message, its contents will be shown under the list of messages. In order to delete a message, select it and press the button Delete. To reply or forward a message, use the buttons Reply and Forward. The tabs Drafts and Sent work exactly the same way, and as their names tell, contain the delayed and already sent messages. 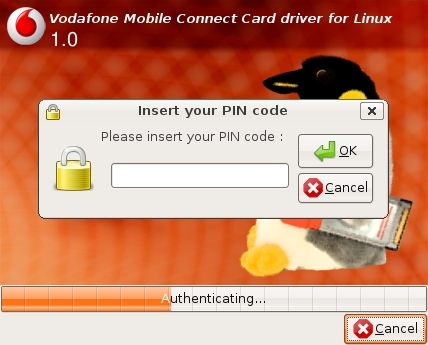 Vodafone Mobile Connect Card Driver for Linux can manage an address book synchronized with the one in your phone card. 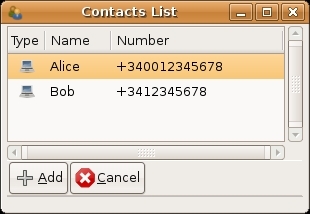 The phone numbers stored can be editted from the Contacts tab. New contacts can be introduced with the menu entry Contacts -> New, when created, you can choose to save them in the mobile card or in the PC. Contacts can be deleted with the Delete Button. When a message is received, if the sender is a known contact, the application will advice about the event using the contact name. And when sending a SMS, recipients can be selected from the Contact List. If you are a programmer, it should be easy to make it work with other cards. Please see the developers' documentation included with the source code. This program has been updated and is difficult to install, having had a LOT of trouble getting it working I have placed a quick tutorial here.